Ben Gurion International Airport (TLV) in Lod – Israel, is notorious for being the one of the world’s most secure to enter and exit, and it’s no secret it’s security measures are based on racial profiling. I had heard many ‘horror stories’ of entering Israel through this route and was advised by many people to fly through Jordan to reach Jerusalem, which some say is easier (I think that is also debatable). Could being a Muslim really change the world’s perception of me that much? 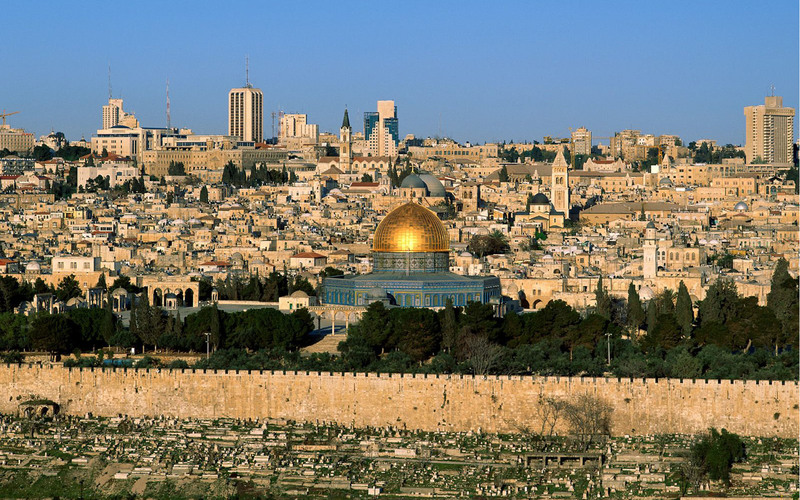 I had done my research, felt prepared and wanted to experience this for myself, so I decided to brave the flight into Israel via Tel Aviv to reach the Holy Land. 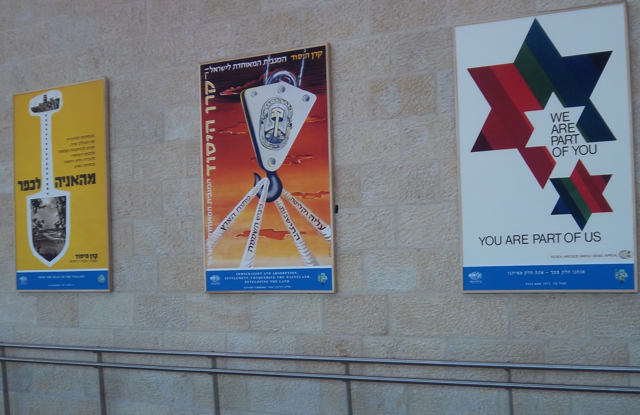 On disembarking the plane and walking through arrivals my friend and I were faced by many Pro-Zionist posters and false propaganda which made me feel a little uncomfortable, I took a minute to stop and take it all in, then it actually hit me I had landed in Israel. Up until this point we hadn’t been asked any questions and I had a feeling things were about to change. I was grateful my friend decided to wait with me, we had agreed were in it together. The room was quite small with a TV. I couldn’t recognize anyone from my flight and we all seemed to be ethnic minorities waiting, some of whom looked as though they had been here before and knew the deal. Me being me, tried to engage eye contact and start a conversation but there was no interaction, people were not trying to stay in this room and make friends, it was pretty much everyone for themselves, any false associations could lead to more trouble. Two hours later, without any explanation to why I had been detained, I was called into a small back room to see the immigration officer who pointed to the visa for Pakistan in my passport asking if I had been to Syria. I had never actually been to Syria, but he did not believe me even though the name of the airport could clearly be seen on the visa stamp, ‘Allama Iqbal International Airport, Lahore’. He was annoyed as though I had lied to him, I was tempted to look it up on my phone to show him but I thought this would make matters worse, highlighting his ignorance. He asked me to return to the waiting room. At this moment, I realized without any words, being Pakistani was an almost a crime upon entering Israel, due to their very colorful history. At this point, my genetics were enough to make me a ‘suspected terrorist’ and boy did they make me feel like one! It really was one of those situations where you feel as though you could be, ‘framed’ for any number of things and if you are, no one would even be able to help you, your fate is completely at the hands of someone else, and that someone else does not like you.. at all. I was then made to wait a few more hours, people were slowly being given their passports back, I instead was bought a bottle of water and a sandwich so I knew I was not going anywhere, it was time to get comfortable! Despite the situation I did appreciate being given the food and water, not that I ate it, I had come prepared with my own food for this eventuality. I was realizing I was going to be the last one left in the room and the longer I wanted the higher the chances were of me being deported. I was then told to go to a different room in the back, the room was very small luckily the door was kept open, otherwise I would have suddenly have developed claustrophobia. ‘How are you?’ asked the lady about to question me very politely, ‘I’m fine thank you’ I replied smiling and trying to keep calm, ‘How are you?’ I attempted to match the small talk. We sat down and she informed me, ‘Now you are in the Security Control Room, I do not care why you are in Israel, who you are working for or if you are with any volunteer groups. It is my job to assess if you are a threat to the state of Israel’ I was half offended, half flattered, but very confused! First of all, it seemed I had offended Israeli security by having the audacity to enter Israel being Pakistani and secondly it was a crime if you were a humanitarian volunteer (which was such a crazy thing to hear to me, and it also meant I had something to hide). It was at this point, I knew all the harsh stories about airport control were actually true and they were taking this very seriously. My eyes fixated on a photo of Jerusalem on the wall, the beauty of the Dome of the Rock was dominating the photo so I kept looking at it as a beacon of hope, this is where I REALLY wanted to be. I pictured walking on the grounds. I knew I had to be confident and maintained eye contact and conviction throughout answering all of my questions, I knew my body language was being monitored, I knew this woman was skillfully trained in interrogation techniques. I knew the outcome of this conversation would determine if I was going to be allowed into Israel or deported. Many had been in this pos ition before me, some had succeeded, some had failed, but I was not giving up without a fight so I remained as focused as I could, without looking nervous. ‘What is your grandfather’s name and date of birth?’ was the first question she asked me, with embarrassment I said I didn’t know. I thought this was quite a random question to open with but if anything I think it was to gauge a reaction. She handed me a pen and piece of paper, ‘write down all of your email addresses, phone numbers and home address’ she was then frantically searching these online to find any information about me that she could. I hoped nothing embarrassing or incriminating would come up, because you never know. ‘List all of your father’s brother’s names and dates of birth’, as I did she searched on a computer for what I assume was any, ‘terrorist’ links to my family names online, she shouted some names out at me asking if I knew them and of course, I didn’t. I was concerned because Arabic names are very common and I could have been falsely linked to anyone with the same name, and denial would have been futile, but she was going by the rough age groups. I had taken photos of my parent’s passports so when she asked me about their date of birth and place of birth I showed her the photos, ‘why do you have these’ she said looking very confused, ‘because I knew you would ask me’ I said feeling maybe a bit too organised lol. ‘Why are you in Israel?’ she asked. ‘I want to visit the Dome of the Rock and Masjid Al-Aqsa for my birthday, it has always been my dream to visit Jerusalem’ I replied which I meant from the bottom of my heart. ‘OK where else will you go in Israel?’ she asked, ‘I’m not sure yet, Bethlehem, Tel Aviv and perhaps… Ramallah’. A sudden smirk appeared on her face, ‘Why Ramallah?’. I said, ‘Why not, I would like to see Ramallah it is a very famous city’. She smiled in disagreement, ‘Ramallah is not famous’ to which I cheekily said, ‘everyone in the world knows Ramallah’. Now if you don’t know, Ramallah is known as the capital of Palestine, so it made my political associations very clear here at this point. We both knew the situation but there was complete denial about acknowledging it to each other and the facade continued. Even though I was expecting it, to my horror, I was then asked to unlock my phone and hand it over nonchalantly as if it was a normal procedure, well maybe it is in Israel. She began looking through my personal emails, Facebook and whats app messages. Even though I had nothing to hide, it was an invasion of my privacy. I had taken my work contract and ID card which she used to look up online, ‘can you show me your LinkedIn profile?’ as if to verify I was not carrying a false identity of job, ‘sure’, I said as I opened the app. Luckily for me my everyday job is not political at all, so it was fine. I was asked who people messaging me with Arabic names were. This was a total violation of my privacy I had nothing to hide but I did not want a stranger going through my personal information, if I had refused I knew I would have been refused entry to Israel point blank, so I had no choice. ‘Did you book your own flight’, ‘yes I did’. ‘Why did you also book your friend’s flight?’ she asked, I said ‘because I’m organized’, I didn’t think there was anything suspicious about doing this. ‘Show me the date you booked your flight’ she requested so I retrieved the email on my phone. Easy, but then was the problem, ‘Where will you stay?’ she asked, ‘Bethlehem, Sahara Hotel’ show me your hotel booking, ‘I haven’t booked it, I was just going to show up’. Her facial expressions changed, ‘No one comes to Israel without somewhere to stay’ she said angrily. ‘I wasn’t sure if I would get in and I didn’t want to waste my money’ I said without thinking. The tone of the conversation had changed, ‘why would you not get into Israel’ she said in complete denial that people are rejected every day for no reason at all. ‘Who do you know who has not got into Israel and why’? This was a question I could not answer, I did know people who had been denied entry, but they were not guilty of anything other than being Pakistani, I gave half a name for her to search online. I felt like I had slipped up and made a huge mistake here, even though it was an innocent one, it sounded as though I was trying to cover something up when I actually wasn’t at all. We carried on talking, there was slight passive aggression but we kept things friendly, I did not want to come across rude and tried to build a rapport and be as honest as possible, after all I had nothing to hide. We managed to make some small talk about relationships and failed friendships which I am not sure if was genuine or not but it was something we both connected on as women, ‘I have also been through similar things’ she said.e went back to her ‘friendly persona’ telling me not to worry, ‘I know exactly what type of person you are’, I am not sure what she meant but, I assume a peace activist (which I cannot see as a bad thing?!). I replied with, ‘good, I am happy to answer any questions’. However some of the questions were so twisted that I was made to feel like a liar, even though I was telling the truth and being accused of lying. You feel backed into a corner so much so it’s difficult to not get sucked into the lie. She listed several countries asking if I had been to them, but added Syria into the middle as if to trick me into a confession for going to a country I had never been too, but I was alert and denied this as quickly and sternly as I could. The staff had clearly been highly training in interrogation techniques and reading body language. Next what struck me was the assumption that I was a Muslim, I was never asked but this was just assumed by my name, so I really feel for those who have Arabic names by heritage but are not Muslim. Even though at the same time why should that even matter, we are all individuals without own interpretation of religion. I was asked what type of Muslim I was, ‘Sunni or Shia?’. I’m assuming one sect is seen as more dangerous than the other. I guess this part of the questioning was to assess my ‘Islamic terrorist threat level’. ‘How many times a day do you pray?’ she asked, which I think is a very personal question, I responded with a somewhat sarcastic tone, ‘I don’t pray 5 times a day and as you can see I do not wear a hijab’ Plus I was thinking of all the prayers I had missed while I had been kept in detainment. ‘OK’ I felt mocking me, Now I didn’t feel British or a good Muslim! lol ‘Do you have a favorite Surah from the Quran?’ Now this I didn’t want to answer in case any of the text was misinterpreted, so I said I didn’t have one, but liked many verses, which is also very true. I was asked the name of my local mosque so it could be searched online to see if it preached any hate. She asked me the same questions about my friend, who wasn’t asked anything herself at all, I don’t feel comfortable answering about people’s religious views and faith on their behalf. Then came the relationship questions, was I married, was I seeing anyone etc.. I honestly didn’t think the Israeli border control would be so interested in my love life, being Asian there is enough pressure about not being married in your 30’s but here I was getting it from the IDF as well! I’m assuming this was to determine if I was visiting a Palestinian boyfriend. I was asked my questions about the friend I was traveling with, her date of birth, full name, how we know each other, how long have we known each other. In prep for the trip I did ask her to confirm her age to me but in the fashion of older women, she didn’t want me to know her age, so as I was asked this question it did look suspicious I didn’t know. I went into a lot of detail of how we knew each other. She searched my phone for Palestinian / Israeli numbers and found the British Consulate, ‘Why do you have this?’ she said thinking it was very suspicious. ‘As a British citizen when I travel abroad, I always like to have this contact for emergencies’ I replied which is actually true, but I felt that she did not buy this reason. ‘Why do you have these other numbers?’ she had found some of my contacts from various organizations I was going to meet, ‘I just found these online in case I want to do some tourist activities’ I replied. Again she was very suspicious but then her eyes moved to my mobile phone screen, it was a photo of me with Nasir Jones. ‘who is that’ she asked me, I replied, ‘That’s Nas he’s my favorite rapper from America’. To this, she replied, ‘You’re very lucky to have a photo with him’ and I knew at this point I was very lucky indeed!! Call me crazy but I feel this was the point where my suspected terrorist threat level was reduced, after all I was into American music! After this I was asked to go back to the waiting room, I really felt I had blown it by having phone numbers in my phone, but then my photo with Nas could have balanced it out, I had to just wait and see. Back in the waiting room I was given another bottle of water and a sandwich, while I guess they did some more digging on me. I was switched between room so the airport staff could use the waiting room to have their lunch whilst watching the TV. I peered into one of the offices where an Israeli security official was filing her nails. The staff seemed very relaxed, after all they didn’t have anywhere to go, and they were the ones in control of my fate. The thought of spending a night in a prison cell after a 5 hour flight and 7 hour detainment was not appealing to me, I wanted to feel the air on my skin and I was determined to have come this far to be released. Even though it’s not even close, I spared a moment’s thought for all the political prisoners in the world, those who are completely at the hands of crooked institutions. I looked at the wall and it was a huge pillar, I imagined this is what many of the walls in Jerusalem would look like. Finally, after another 3 hours of waiting, I was handed my passport without any words, I was free to enter Israel. I was so happy the ordeal was over. I felt very lucky to have gained entry as many I know had been denied, and now I felt I had earned it. Our visas wouldn’t scan for the automatic exit, as we had ‘been in the office’ so we had to ask security personnel to let us out. Eventually, we found our luggage which had just been dumped unattended in the baggage hall for 7 hours. There were many bags but I couldn’t see anyone else at the airport, had all of these people been deported? Were they in different rooms? Of course now we were running 7 hours behind schedule to leave the airport, it was midnight and we were unable to get a direct taxi to Bethlehem as it was in Palestinian territories. The only option was to get the shared shuttle bus to the Gilo 300 checkpoint on which we met the most charming young rabbi from LA who was studying in Jerusalem for a year but had also studied at UCL in London. I made a comment that the streets were completely empty, ‘it’s Shabbat’ he said, of course, I hadn’t realized. We were the last drop off by the bus to the checkpoint which we had to cross on foot, as we did armed Israeli soldiers began to shout at us in Hebrew, not being able to understand I took out my British passport and they signaled for us to come closer. Once they saw we were British their attitude totally changed, ‘Welcome to Israel’ they said as they blew us kisses. It was very strange. We crossed the checkpoint which was completely empty because it was so late, but I could imagine it would be like herding cattle during the day the way it was set out. On the other side there was only one taxi driver who was wearing a balaclava (it was very cold), though this seemed a little intimidating we had no choice and by this point all I wanted to do was get to my hotel! So we took the ride and finally arrived at 3 am where the poor hotel staff had been waiting for us to arrive several hours earlier. I’ve never been so openly objectified to racial profiling in my entire life, and to have it from state security in 2017 is mind-blowing to me. Despite this I am happy for this experience because unless you are actually in these shoes you will never know how it feels and unfortunately for many people this will never be the case. If this was an effort to deter me from every trying to return, it will not work because for people like myself, the harder you try and make life for us, the harder we will try to resist. Palestinian people have to go through this on a daily basis, I had to only do it once to stand with them in solidarity. Thank you for writing this, very interesting and insightful article, we enjoyed reading it. Please get in touch with us using the details below, we would love to further talk with you about your time in Palestine & Israel and your blog site.